A Tech Investigation Services Inc. : Camera Installation . : A TECH INVESTIGATION :. Digital Video Recording (DVR), as a visual surveillance technology, is designed for monitoring residential and business environments and activities from anywhere in the world. What was once an almost exclusive domain of commercial businesses, DVR is fast becoming just as popular in primary residential and secondary vacation homes or rental properties. Honestly how many of us on a daily basis forget to turn on our alarm systems or leave doors unlocked? Your most precious assets are your family & residence. Perhaps you have a vacation house on Cape Cod or a cabin in the mountains? Now you can monitor your second residence in the off season or anytime you are not there. Maybe you travel often? Now you can see your children each night from the privacy of your hotel room. Internet Protocol-based camera systems make it easy and affordable to view your camera feeds via the internet from your laptop, from anywhere in the world. Our cameras record 24/7, and if a particular incident occurs you place a DVD into the DVR and secure the evidence. It does not matter if you own a restaurant or a convenience store; or a professional office or a small kiosk at a mall. 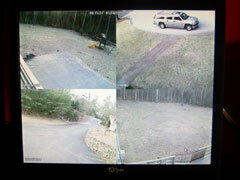 The value of having a video surveillance system monitoring key places in or on your business property is significant. Keep an eye on the cash register, employees, the back door where deliveries occur, or the front door, where customers enter from your own PC located anyplace – in the building or remotely. A Camera Surveillance System can help reduce internal and external losses to your business. You can protect your facility from theft, improve customer service, and prevent vandalism by recording areas of critical activity. A typical camera system monitors interiors in specific areas such as inventory and exterior such as shipping/receiving. Once people know their activities are being monitored, they will be discouraged from engaging in illegal activities. Let A Tech Investigation provide you with a custom solution for your home or business lifestyle that takes full advantage of today's digital DVR technology. Monitor your cameras anywhere in the world over the Internet. Receive video emails that show activity specific to your needs. You can customize what and when you want to monitor based on the user definitions you create. Get the visual information you need with 24-hour digital recording. No matter what the application, A Tech Investigation will ensure your DVR residential project is scaleable, reliable and secure. Our work is contracted by licensed professionals who are experienced and who have completed and passed a thorough security background check.